Guild continues to hand out delightful treats to the light music connoisseur with this spanking new issue in their wonderful Light Music series. This time, it's the turn of British Cinema and Theatre Orchestras with a concoction of works that recreate the mood from the pre war and immediate post war days. The plethora of artists involved in this release beggars belief and the comprehensive totality of the undertaking continues to confirm Guild's dedication to the genre. You would be somewhat surprised to find Albert Ketelbey's much loved 'Bells across the Meadows' in this compilation but it is beautifully done by the London Palladium Orchestra under Richard Cream's direction. Other memorable pieces here are the works by Percy Fletcher and the emotional selections from the Jerome Kern musicals, especially the immortal 'Showboat'. 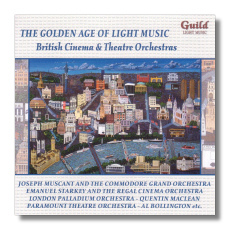 Another intriguing feature in this compilation are the orchestra names such as 'Troxy Broadcasting Orchestra' and 'Plaza Theatre Orchestra evoking memories of a vanished age.